It is difficult to say exactly how often and how much water a bonsai tree needs due to varying weather conditions, humidity, size of pot, and type of soil mixture. However, it is crucial to realize that watering your bonsai is by far the most important aspect of caring for bonsai to ensure tree health. More bonsai are killed by improper watering than by all other causes combined. A general rule of thumb is to check on your tree everyday making sure that the soil is moist and to only water in the evening (this ensures that your tree does not experience a shock from a dramatic change in soil temperature) if it becomes slightly dry. Never let the soil dry out entirely and never water on a routine if you have more than one tree in your collection. Each tree needs to be watered separately so as to not over water. With time, as you gain more experience, you will no longer need to feel the soil to test for moisture, but instead you will be able to tell by just looking at it. In general you should notice that your tree will need to be watered about every day or two. However if the weather is warm and your tree is outdoors, it may be necessary to water a few times daily. 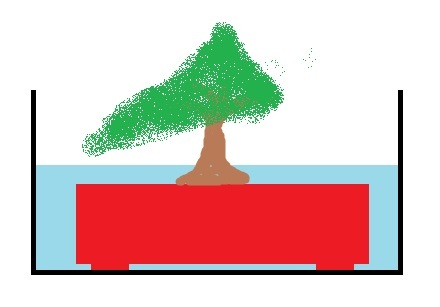 How do I water my bonsai? Water in the evening and if necessary then in the early morning. 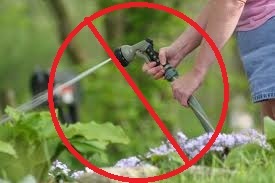 Be careful about watering in the morning, because if it is going to be a warm day, the water could heat up fast and scorch your tree's roots, or if you get water on the leaves, the drops will act as lenses for sun rays and cause leaf scorch. It is best if you water from above using a hose with a fine rose (watering head)/ shower setting or watering can that has a very fine rose. Avoid too much water pressure as this will erode soil and might damage your tree. Another alternative way to water your bonsai is through submersion. Place the tree in its pot in a bin or tub and fill the bin all the way up until the water rises no more than an inch up the trunk of the tree. Leave your tree like this for about three minutes. This allows for water to seep into the smallest cracks and loosens up the soil if you are using poor quality potting mix or if you forgot to water your tree and the soil dried more than it should. You can remove the tree once there are no more air bubbles rising to the top of the water. 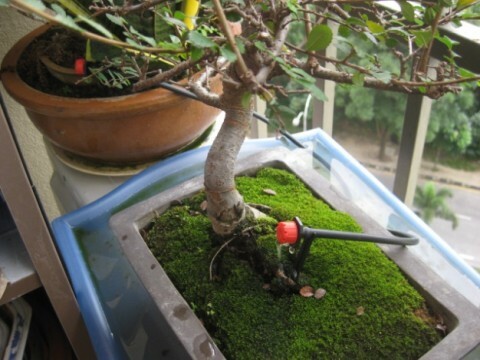 If you have a large collection or are feeling particularly lazy, you may install a drip system to water your bonsai. The benefit in this is that your trees will get watered regularly and you do not have to do it yourself. However, please be aware that different trees require different amounts of water and watering changes by season. If you are not careful with this technique, you will end up with a bunch of dead trees either from root rot (most likely) or from not enough water. If possible it is always best to collect your own rain water for watering your bonsai. Rain water is pure and washes out mineral deposits trapped in the soil from using tap water. If rain water is not available, using regular tap water is perfectly fine unless it is undrinkable and contains too many chemicals. If using tap water, let it sit overnight in a bucket. This way, some chlorine can evaporate. You may use distilled water or purified water (reverse osmosis for example), but they lack necessary minerals for bonsai health, so be ready to supplement. If you have a fish tank (freshwater) or a pond, you can use some of that water to water your bonsai. The fish produce nutrients that are beneficial to trees. Does watering change with the seasons? Yes! For the most part follow standard watering procedures spring through fall on all trees. However once your trees start to enter dormancy (sometime in fall), rain and snow should be sufficient in sustaining them throughout the winter months. However, in some instances where there is not enough rain or snow, it may be necessary to water every now and then. For the most part though, it is safer to be on the dryer side than on the soggy side since deciduous trees don’t have leaves to support and as a result extra water cannot be absorbed as efficiently and leaves the tree prone to root rot. Tropical and indoor bonsai should remain inside and watering does not change during the winter. Hose Watering: notice the fine stream. Jet Stream: is a big no no. Unless you want broken branches, holes in the soil, and airborne soil and maybe trees, please do not do this!